EVERY 365 DAYS, THERE ARE QUESTIONS TO ASK AND THOUGHTS TO EMBRACE. IT’S ALL ABOUT HOW THE YEAR AHEAD OF YOU CAN COUNT IN LINE WITH THE CONTENTS OF OUR HIGHEST CALLINGS. The IDEA: Another year is dawning, what will we do DIFFERENTLY? What if you are told that an environment exist where you can have a CLEAR PEEP into 2015 through PRESCIENCE, in a way that gives you KNOWLEDGE, UNDERSTANDING, POWER and CONTROL over the CONTENTS of the EVENTS in it? How much will you pay to access that environment? Well, you will have to answer that question right away, because the environment do exist and it’s your turn to decide for or against it. It’s called PRESCIENCE---the fact of KNOWING something in ADVANCE as FOREKNOWLEDGE. Whether it’s your birthday and you have a whole new year ahead of you, or it’s your wedding anniversary and you have another year ahead or it’s simply December---the end of the year---or January---the beginning of a new year and your are getting ready for another 365DAYS, the COMMON DENOMINATOR to all these different scenarios is the TRUTH that there are THOUGHTS to SUSTAIN, BELIEFS to AUDIT, new GOALS to engineer and PLANS to EXECUTE. The SOLUTION: The NEXT365™ INTERACTION is about what will or might happen 2015 and who you must be in it. It will help you with the mentality and intelligence to sit and to run all through 2015 and create winning experiences consistently through the year at the very centre of friction and heat and chaos. It will deliver guidance, counsel, direction, encouragement and focus. EXPERIENCE: It takes just 5hrs on-location to kick-start your ascent to the next level in 2015! It’s a black tie event. EVENT POINT: The LUSH and SERENITY of Protea, Ikoyi, Lagos and will add all the ambiance value. Black Carpet starts at 5pm. 19th December 2014 at Port Harcourt, Rivers State and 20th December in Lagos. EXCHANGE: Apart from a compelling, USABLE, TRANSFERABLE, AND REWARDABLE KNOWLEDGE experience, you will take away, the video of the event (shipped to you at no extra cost), you will receive our best-selling 4-pack audio selling in four countries: NEXT365 Audio work and a FREE DOWNLOAD of our “This is Wisdom Video Series”. ALL THESE AND MANY MORE FOR JUST FIFTY THOUSAND NAIRA (N50,000) ONLY. PAYABLE INTO ACCOUNT NAME: THE OLAKUNLE SORIYAN COMPANY. 0054285748. DIAMOND BANK. 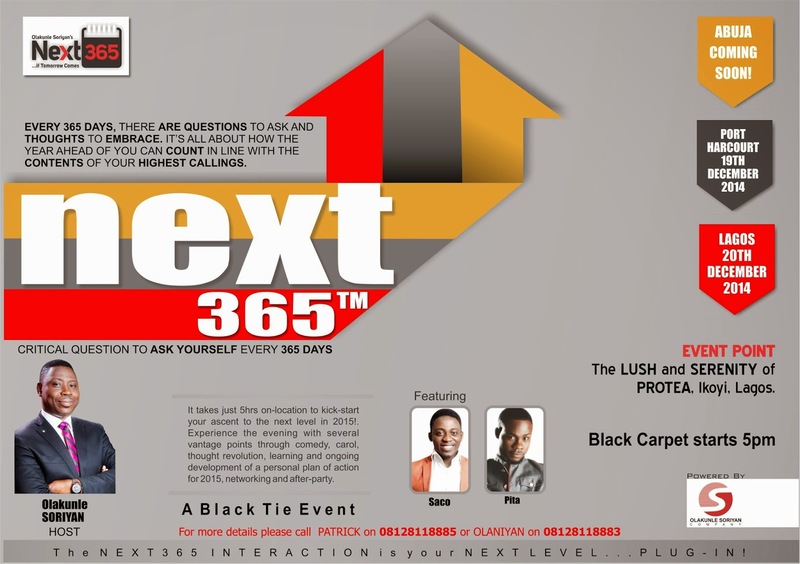 The NEXT365™ INTERACTION is your NEXT LEVEL… PLUG IN. For more details on event please call PATRICK on 08128118885 or OLANIYAN on 08128118883.